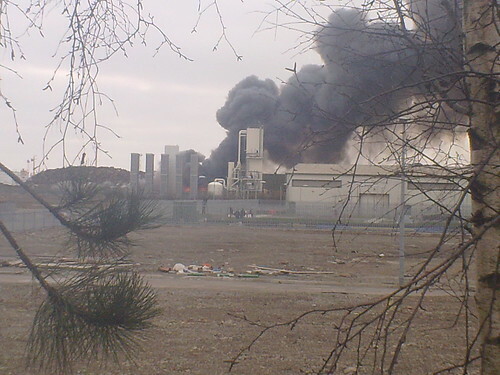 Explosion at an industrial site off Rover Way in Cardiff. Locals said a gas pipe blew up about 8.30am, but it was still blazing away when I drove round there. Lots of smoke – and lots of people watching it burn. Nipped out to buy the papers this morning and saw a black plume of smoke rising from the city centre. Two minutes later the paper-mission was abandoned and husband was driving towards said smoke. The first photo was taken with an iPhone 3 on zoom, the second with a Nokia N86 – personally, I think the iPhone image is the more striking. I was uploading pix using Twitpic, and it ate three out of the four I used. So I switched to my Posterous site and that’s where my loyalties will be lying in future – Twitpic has let me down three times now, and it’s only force of habit that I’ve kept using it. Enough. I’ve deleted it from my phone. I also tried to shoot some video with the Nokia, uploaded to my YouTube site via Pixelpipe, but it was a bit far away, and I was being pretty jostled by the crowd that had gathered so it really wasn’t worth it. However, crappy video aside, it brought home to me again just how useful Pixelpipe is to a journalist on the go, without recourse to any kit other than a phone. I could have potentially done photos, video and audio and uploaded them all via the Pixelpipe Share app on my phone. Really useful for when you’re in a hurry – or for when you need to get media off your phone to somewhere it can be accessed by another person quickly. I would have loved to have tried out the N8 I now have for work, but it has so far thwarted my attempts to get Pixelpipe to work; I think it’s more to do with the contract than the phone, but it needs further investigation. An awesome camera on a phone is a fine thing, but the ability to get the photos out to the wider world is a finer one.